Gregory House is an arrogant, anti-social, sarcastic medical doctor that begrudgingly saves the lives of numerous patients with his team of crack-shot professionals. Their hospital is brimming with patients of every illness, and Dr. House uses his keen intellect and oddball methods to discover what ails them. 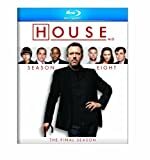 In his personal life, House is a painkiller addict with an ever-burning passion for his ex-wife and a true love of all things medical. However, while at the office, he hides his softer emotions behind a barrage of crude humor, monotone facts, and dry-wit comments. House is also a medical genius who sometimes will make the wrong diagnosis simply to keep his team on their toes. Irony, humor, addiction, and tragedy run hand-in-hand when the doctor is in.